The Becoming an Outdoors -Woman® (BOW) program is a workshop primarily aimed at women 18 years or older to learn outdoor skills usually associated with hunting, fishing, and other outdoor pursuits, that combines a fellowship experience with women. Originally started in the United States in 1991, Nova Scotia began offering the program 1997. 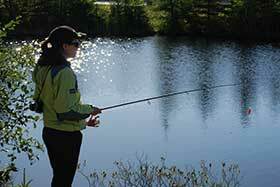 Its primary focus is assisting women to overcome barriers, whether social or financial, to learning outdoor skills. If you are a novice or have no experience in hunting, fishing, or other outdoor recreation but want to learn, this program is for you.